This diet method emphasizes overall health, focuses on the total diet, and is user friendly. No one food group is more important than another in the Food Pyramid and its use allows for flexibility with food substitutions. Complex carbohydrates form the base or foundation of the Food Pyramid. These starches are high in vitamins, minerals, and fiber, and medium to low in fat unless the cooking adds fats. The recommended number of daily servings are 6 - 11. The second level is divided into vegetables and fruit. Vegetables are high in vitamins A, C, and folic acid, as well as fiber and the minerals iron and magnesium. They are low in fat unless it is added in cooking or processing. Three servings are recommended. Fruits are low in fat and high in vitamin A, C, and potassium. Two fruits are suggested for each day. The third level focuses on protein, divided between meat and dairy foods. Two servings daily from dairy products provide protein, vitamins, and minerals except for iron. Milk, yogurt, and cheese are dairy foods. Some dairy choices are high in fat. The meat group includes dry beans, nuts, and eg. The nutrients include protein, B-complex vitamins, iron, and zinc. Some choices are high in fat and the recommendation is two low fat servings daily. The top or peak of the Food Pyramid is fats, oils and sweets. Salad dressing and oils, cream, butter, margarine, sugars, sodas, candies, and sweet desserts provide calories without a lot of nutrients. However, a person may eat these foods sparingly for enjoyment without negative consequences. The Food Guide Pyramid was designed to depict variety, moderation, and proportions. The size of each section reflects the number of daily servings. Many people use the Food Guide Pyramid for tracking their food intake because of its simplicity. Using the Food Guide Pyramid does have its drawbacks. It does not limit food choices to those low in calories. 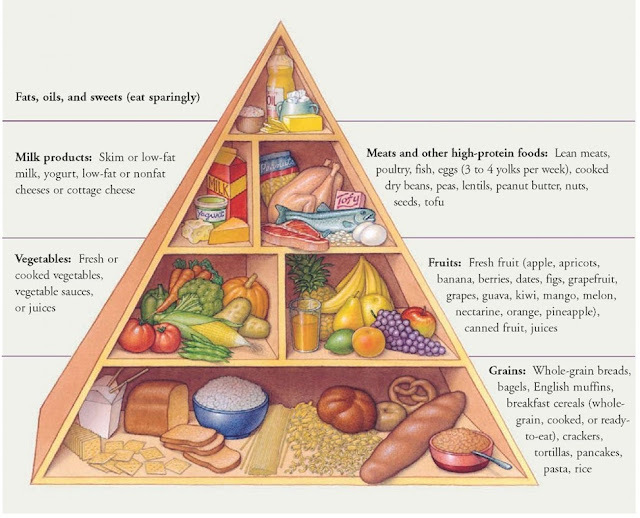 A person using the pyramid needs to have knowledge of the approximate fat and calories in foods in order to make effective choices. The Food Guide Pyramid makes no attempt to point out individual high fat or high sugar foods within the individual sections. A person may choose the right number of servings from each group and still make poor nutrient choices if they use mostly processed foods and few raw fruits, vegetables, and whole grains. Adequacy - Choose the minimum numbers of servings in each section (6,3,2,2,2). Balance - One type of food is not overemphasized. Calorie control - Focus on the nutrient dense lower levels of the pyramid if you want extra food, but also watch the serving size! Moderation - Using some of the fats and sweets from the top of the pyramid sparingly adds enjoyment to the food. Variety - Within each section, choose different foods and experiment with new flavors. While I have great exercise habits, I tend to avoid any monitoring of my food intake, mainly because I love to eat! My excuse is that all the exercise is plenty to stay at the fitness level I want. despite the fact that I teach a nutrition course! So after noticing that I was starting to look and feel a bit less than my peak, I decided to bite the bullet and take a hard look at my eating habits. I used the Food Guide Pyramid, focusing on low fat choices. I drew pyramids on pieces of paper, and sectioned them off for the contents: Complex carbohytrates as the base, veggies and fruits on the second level, meat and dairy third,and the "other," fats and sweets, on top. "It's hard to eat that much." "Wow I sure don't get enough complex carbs." "I guess I like eating fruit and veggies in mass quantity." "What in the heck HAVE I been eating?" In two weeks - visible changes! The muscle tone is once again showing at a preferred level. The moral: It takes a 50/50 relationship between food and activity for best performance and fitness (appearance, too). Weight Loss: Fraud or Fact?